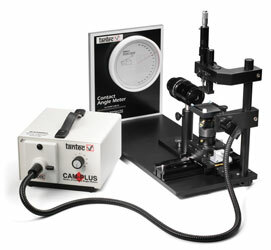 Reliable surface energy measurement and a number of easy-to-use features make the ChemInstruments CAM-Plus contact angle meter an ideal testing machine. A patented "half angle" measurement method eliminates the difficulties associated with tangent angle measurement methods. With simple, reliable and consistent functions, coating operations of all types can quickly determine surface energy measurements. 美国ChemInstruments 公司研制的CAM-PLUS 接触角测试仪集精确可靠, 操作简便等功能为一体,符合国际测试标准 ASTM D20.19, D724, D5946, 及 TAPPI T458 cm-94. 我们发明的专利 “半角” 测试原理简化了传统的繁杂测量方法. 简便, 迅速, 和谐及可靠的表面张力测试结果将有助于各种镀膜生产的质量控制及检验.